As he flew from Toronto to Newark for the next leg of the tour, Conor McGregor enjoyed reliving highlights of his barbs directed at Floyd Mayweather. SOMEWHERE BETWEEN HAMILTON, ONTARIO AND NEW JERSEY AT 30-SOMETHING-THOUSAND FEET — Conor McGregor reclines in a white leather easy chair as the Bombardier Global 6000 aircraft turns southeast. He’s calm now, zoned out, he says, roughly four hours after his second insult mêlée with Floyd Mayweather Jr. He’s still thinking about the show they put on Wednesday in Toronto. He’s proud of the insults that he landed, the way the crowd chanted his name so loudly the ground shook, how he took Mayweather’s backpack and exposed how little cash was actually inside. “Did you see their faces?” he asks no one in particular. For a mixed martial arts superstar who was on food stamps four years ago, this is different. This is hardwood floors and oak paneling and Dolce and Gabbana bags strewn everywhere. This is his face on every channel, his words on every Web site, his crowds vociferously booing Mayweather in two countries, on consecutive days. The boxing purists can decry the fight between Mayweather and McGregor for what it is—an MMA star trying to hand the best boxer of his generation his first loss. They can say that McGregor stands no chance. But here, as the plane cruises 627 kilometers (or just under 400 miles) to Newark, N.J., in this cabin, they believe. “The world is about to be truly shocked here,” McGregor says. Gone is the bombast from the presser, the theatrics, all the strutting across the stage. McGregor’s nutritionist, George Lockhart, hands over what he later describes as a “fat ball.” It’s a mix of coconut, flaxseed, chia seeds and peanut butter. As McGregor and Mayweather spent what seemed like hours in each other’s faces this week, it was obvious that McGregor is the larger man. But that’s not Lockhart’s primary concern. He knows they’ll need speed as much, if not more than, power, which is why McGregor eats greens and hummus and lean meats. A flight attendant stops by with almonds, cashews, kiwi and grapes. It’s past midnight now, into Thursday and yet McGregor doesn’t seem tired. He’s with 12 members of his inner circle (and me). The group includes training partners, staff, management, friends, the nutritionist and the team doctor. The best way to imagine what it’s like aboard is to picture one of your close friends suddenly coming into money. You fly the way that everyone should fly: with minimal security, WiFi fast enough to stream video and no one telling you to turn your phone off or buckle your seatbelt. McGregor and his friends pass the time like friends do. They extend their leather recliners so the foot parts bump into each other. They tell jokes. They watch YouTube clips; his YouTube clips. McGregor wears a white polo shirt, white sneakers and blue jeans. There’s no suit in sight where the pinstripes read “f--- you” over and over, like the one he wore in Los Angeles on Tuesday. He’s confounded briefly over not winning the ESPY for fighter of the year. Demetrious Johnson, another MMA star, took the honor. But mostly McGregor and his comrades are re-living the press conference. He tells of one particular exchange when he and Mayweather stood inches apart, near the end, yelling at each other and pointing fingers and waving arms. I always wondered what fighters said to each other in those moments. Well, in this exchange, according to McGregor, they told each other how much they currently weighed. “You’re too heavy,” McGregor responded. “I’m Sho’ Nuff,” Mayweather said, and that confused McGregor. “What the f--- does that even mean?” he asked. The spectacle had concluded a few hours earlier, back in Toronto, 70 kilometers (about 44 miles) to the southwest. Wednesday marked the second stop on a four-day international promotional tour that will eventually stretch from Los Angeles to London. But “promotional tour” didn’t quite cover what it felt like. The first two legs felt grander, more absurd. Vaudevillian. Kardashian. More like a WWE prelude than anything in sports. 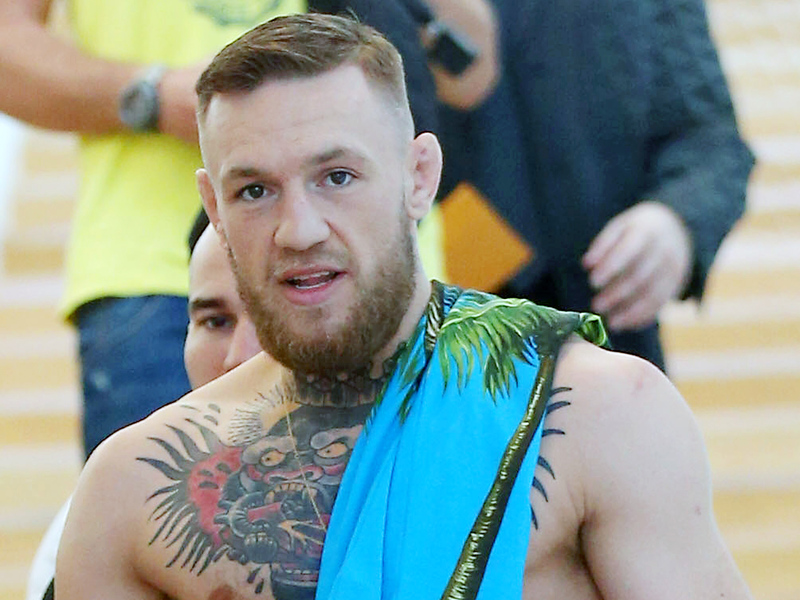 McGregor made sure the event Wednesday was even crazier than what took place in Los Angeles the day before. He sauntered onto the Budweiser Stage after fans had filled every seat in the amphitheater and spilled onto the lawn above. He looked out over a sea of humanity that was either rooting for him or against Mayweather and saw them holding signs making fun of Mayweather’s reported IRS issues. He noticed dozens draped in Ireland’s flag. He stalked back and forth, flexing and shouting and even punting a yellow beach ball that landed on the stage. McGregor had said Tuesday he wasn’t used to the boxing style press conference, where everyone from network executives to managers and promoters give short, dry, often uneventful speeches. Usually, they’re pretty boring, no more than preludes to question-and-answer sessions. But not here. Not for this. The UFC fighter went third on Wednesday, after Stephen Espinoza, the general manager of Showtime Sports, and Dana White, the president of the UFC. McGregor grabbed the microphone and promised not to let go and then he launched into … well, it was something. It was part stand-up routine, part braggadocio, part history lesson, part manhood challenge, part chaos. Even that doesn’t quite capture what unfolded. Consider that the warm up. McGregor described the numerous women who travel with Mayweather as strippers on his payroll. He referenced his own bout with MMA legend Jose Aldo. “They said the same things they’re saying now,” McGregor shouted. “They said I had no chance. They said I’m in over my head. It took me 13 seconds.” He described Mayweather as a runner and boxing’s “biggest b----.” He shouted out Drake, the hip-hop superstar who watched this madness from the stage. On it went. McGregor just kept going, just kept talking, just kept jabbing at Mayweather unlike I’ve ever seen anyone stab at Mayweather before. I’ve covered sports for 15 years on six continents and I’ve never seen anything quite like McGregor’s diatribe on Wednesday. Was it sporting? Not exactly. But that’s not what this is. I found it entertaining. I found myself looking forward to a fight I have dismissed as a bad idea. Rather than weigh whether the animosity was real or whether this was a WWE performance, it was easier to just enjoy it. The crowd went nuts, and despite Mayweather’s forceful rebuttals when he took the stage, the assembled remained squarely in McGregor’s corner, booing the boxing champion after every sentence he spit out. If this were a scene in 8 Mile, McGregor would have advanced to the next battle. He could have dropped the mic. I was supposed to meet the McGregor van afterward but couldn’t get cell service or roaming and while trying to exit the stands, I got stuck behind dozens of drunk fans draped in flags and drinking beers. I spied White at an SUV on the tarmac, and not only was he in a rush to leave but he had no idea that I had been cleared to ride on McGregor’s plane. He didn’t have room in his car and suggested I find my way to the airport, post haste. But the crowd was leaving and there were no cabs. He also didn’t say which airport, and I had to run back to the SUV and knock on the window while the car was moving to ask where I was supposed to head. Hamilton Airport, the driver said. As in Hamilton, Ontario, a good hour away at least. So I took off down a four-lane highway, against traffic, with my roller suitcase, hoping against all common sense I’d just run into a cab. Which is … exactly what happened. The driver’s name was Abdul, and he stopped, and I explained the situation. We then drove an hour to a private hangar, Jetport, next to the airport White’s driver had mentioned. The bill for the cab was $222 (sorry, boss, expense report incoming), and I left extra tip in cash. It has been that kind of week, and it’s only half over. That answer left an opening for a natural follow-up. It seemed fair to wonder if Mayweather and McGregor actually dislike each other, or if they’re laughing backstage about their antics. Espinoza not only believes they do genuinely loathe each other —“absolutely,” he said—he thinks their mutual disdain has grown since Monday. Hours later, as 12:30 a.m. passes, the plane descends toward a private hangar, Signature Flight Support, in Newark. The Manhattan skyline comes into view out the windows on the plane’s left side. McGregor stares at the bright lights in silence, knowing what’s possible, if he’s right and so many others are so, so wrong. He knows what’s in his grasp. The plane lands, and McGregor and company are shuttled past the private helicopters and into a waiting area. Mayweather had apparently arrived shortly before and left for Brooklyn, where they’ll hold Round 3 of Press Conference Wars at the Barclays Center on Thursday evening. “Floyd was here,” says someone who was waiting for McGregor at the airport. McGregor makes his way to customs, where he’ll take pictures with the officers and lament the 1% of battery left on his iPhone and pick from three luxury cars to drive himself to Brooklyn. The rest of his crew will take the shuttle bus that’s waiting. McGregor appears to settle on a white Rolls Royce Phantom, a car that retails over $400,000. He pulls away from the private airport in the luxury vehicle with plans to spend part of Thursday shopping in New York. “This is different,” McGregor had said on the plane, and he’s right, of course. This is an MMA star who believes he can win a boxing match, and not just any boxing match, but one against a boxer who’s generally ranked among the best defensive fighters in the history of the sport. None of that seems to concern McGregor now. He has another press conference to win.